Varalakshmi Vratham is celebrated on Friday, 12th August 2016. Varalakshmi Pooja is celebrated on the Friday, before the full moon day (Pournami), the traditional month of Sravana Masam. 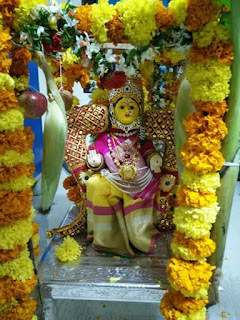 Varalakshmi Vratham observed on the second Friday of Sravana Masam. If second Friday is missed can observe on third Friday. Varalakshmi Vratham is a festival to propitiate the Goddess Lakshmi. It is considered to be very auspicious especially for women. On this Varalakshmi Vratham day, Goddess Lakshmi will be pleased all the virtues of those who worshiped with devotion. Goddess Lakshmi is in eight avatars as Adhi Lakshmi, Dhanya Lakshmi, Dyrya Lakshmi, Gaja Lakshmi, Santhana Lakshmi, Vijaya Lakshmi, Vidya Lakshmi and Dhana Lakshmi. All these Lakshmis on an individual basis brings health, wealth, peace, strength, fame and prosperity. On the auspicious day of Varalakshmi Vratham women's woke-up early morning (brahma muhurtham) then clean the house and do head bath wears mostly red saree. The designated puja area is cleaned well and a beautiful rangoli is drawn on the intended place of pooja. then turmeric powder and kumkum powder. Placing Mango arches to the door and kept turmeric to the door base. Rice is spread on the rangoli and a kalasham is placed on the rice. kalasham composed of rice, coins, five different kinds of leaves, and beetle nut. The items used to fill the kalasham vary from region to region and top covered with coconut and new blouse piece. The sides of coconut arranged with mango leaves. the coconut is cleaned smeared with turmeric and kumkum dotes. Lights which resembles the goddess Lakshmi were placed right and left side of the idol. Then women's will sit front of the Goddess and chant the Lakshmi Stotras, astakam, stuthi and astotharam. Varalakshmi Vratham importance is written on Vishnu Puran, Mastya Puran, Vamana Puran and Padma Puranam. Rugvedam contains the lakshmi Devi story, She has all good virtues of the world and also all the power. However the rest of them are taken to the Gods. Legends told about the virtues of worshiping the Varalakshmi. As goddess Lakshmi is worshipped in eight avatars they are Sree (Wealth), terrestrial (Earth), Saraswati (education), Preeti (love), fame (name), peace, tusti (Fun), and robustness (strength). Women's prepares pindi vantalu 5 or 11 depending upon their possibilities, in the evening they call neighbors, friends and relatives to take vayanam (Thamboolam) which contains two betel leafs, fruits, soap etc. and they offers red bangles to the guests. There are no hard and fast rules in performing the Varalakshmi Pooja. Even a simple prayer will please Goddess Lakshmi.